It was so great to see so many returning customers. It was touching to have so many great comments about my work. I met one man from the US who purchased a tree mug for his wife who is a ceramicist. I got to talk to him about Nova Scotia clay and he told me a story about his wife playing in the Minas Basin mud and he thought my mug would remind her of this. 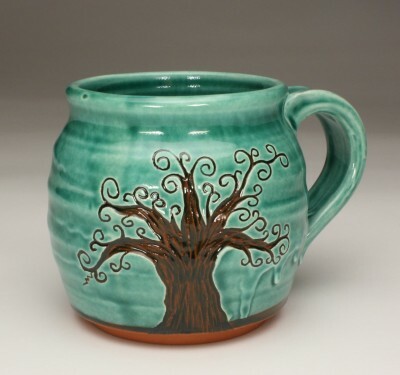 The most popular seller of the day was the tree mug. An image of my display booth, we all had a 4 foot table to use and I did a modified version of my regular booth. It looked good I thought. It was great to have the positive response but it has me wondering why certain things sell well at certain shows but not others. Something to try to learn about. Of course dream birds were popular as well and I was happy to see the great response to them. Next is to plan for a workshop at handiWorks in October, get some molds made of some new jars and bottles and then process the 2000 pounds of Nova Scotia clay I got from Shaw brick last week. This photos is of only half the clay.